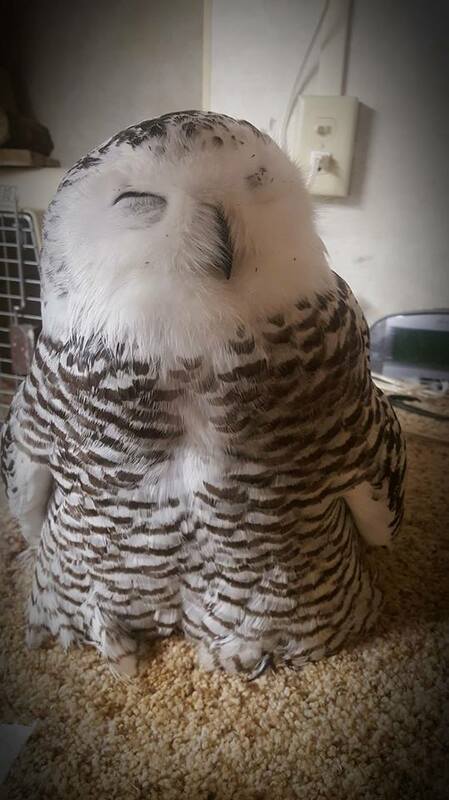 Such a pretty GHO. I hope it gets better so it can go back to the wild. Looks like a snake in the hawks talons. Interesting thread. Thanks for sharing your Nebraska. 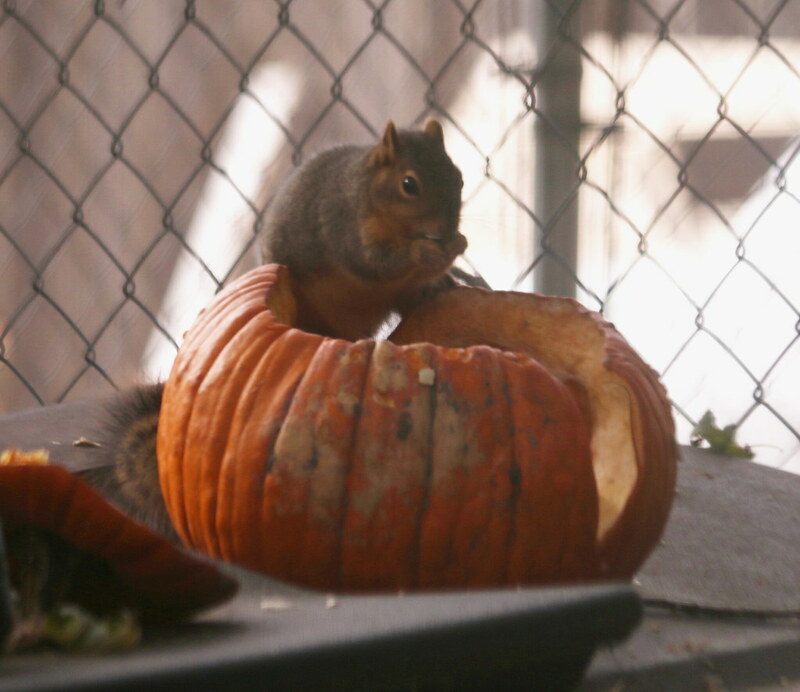 Just in case you have a pumpkin left over after halloween or a pumpkin decoration for fall, don't just throw them away. 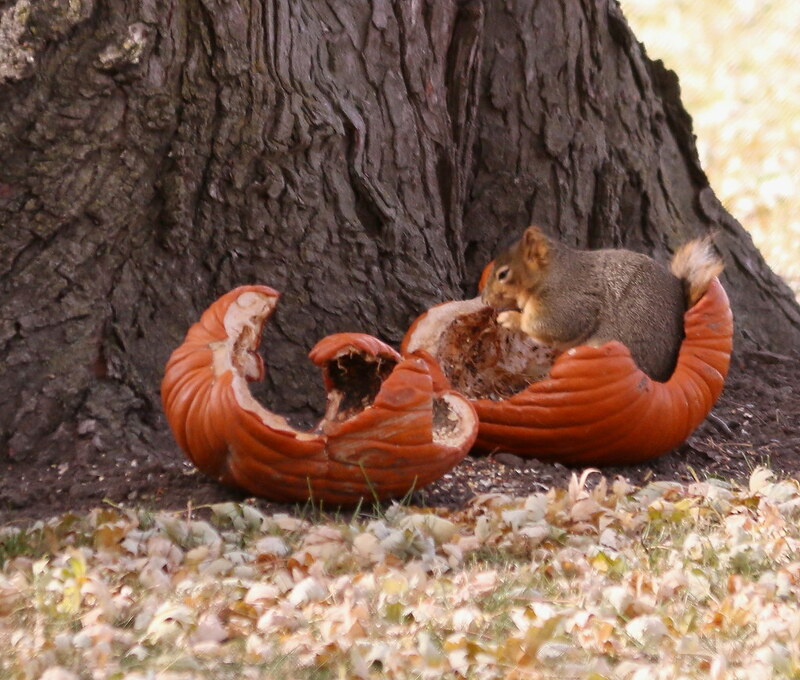 They make a good meal for the wildlife. Remember the little squirrel that had the skin and fur issue? well here he is in this first photo and he is looking really good. Sweet Deb . I love happy emdings. Winter scenes are kinda pretty. 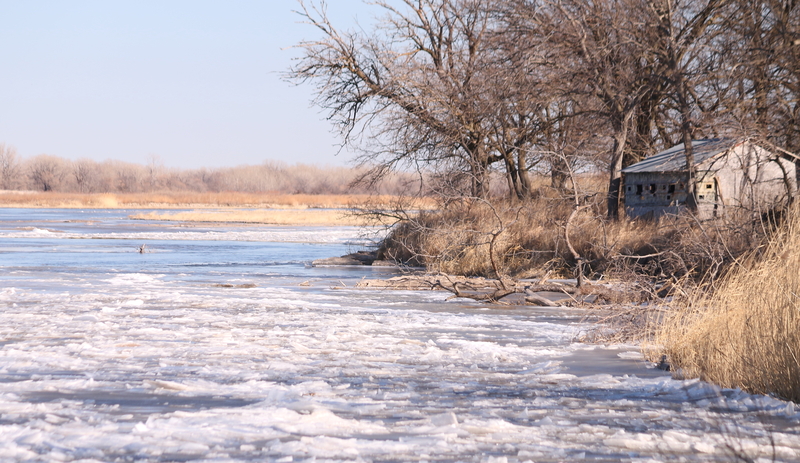 Places along the Platte River are sometimes magical. Places that the Sandhill Cranes visit are amazing. I enjoyed a nice brisk day along the river and thought I would visit a little shack of a place that is a crane blind. Sometimes one that is kinda run down looking holds the most character. 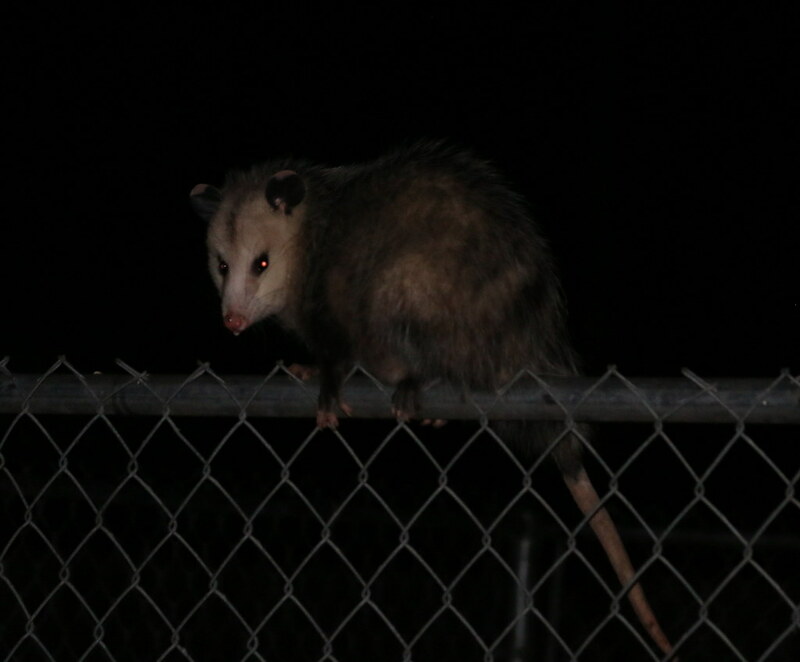 When your dogs go outside and don't stop barking, you go and check out what the ruckus is and to your surprise you find a critter scared to death on the fence. This opossum was froze in its tracks, we got the dogs in the house and went and checked on him later and he had made his escape (I hope). I just love the photo of the old crane blind ... is that the one we were in or another one (where's the burlap?). 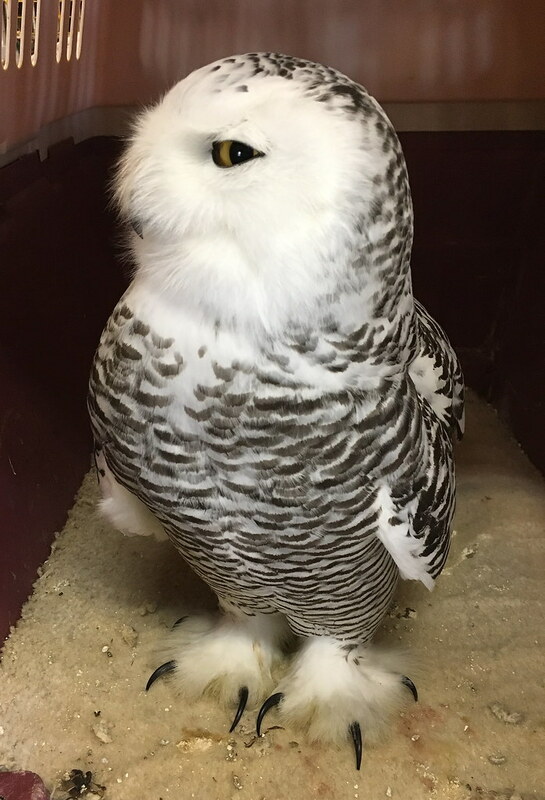 I took a raptor that was injured to our center and when I helped assess and place the bird in the hospital area I asked the director about if she had a snowy owl. Well she pointed to a cage to my left and there she was, a Snowy Owl. I was 3 feet from her- she was standing there looking back at me. It broke my heart to see such a beautiful bird so weak, she weighed just under 2 lbs (normally she should weigh over 5 lbs). She has been at rehab 12 days now and is eating better and is so much more alert. I saw her today and she seemed much brighter, followed us around, clacked and even hissed at us. She is slowly getting more solid foods. The plan will be when she is recovered fully, she will be transfered to rehab up north and they will release her close to Canada. 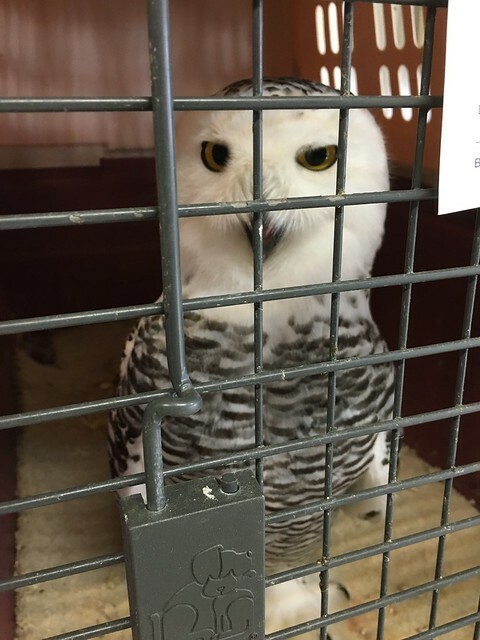 These owls are very hard to rehab so it is really special to have a successful recovery. We are really lucky and she is really lucky. This first picture is not mine, it is from the rescue person that first day. The next ones are mine. Wednesday is our after school program with students in grades K-5. I had asked our raptor rehab center if they had a raptor ready for release if I could do the release for our program. A young RT that had come to the rehab in July with a broken wing and a fracture in its leg was finally ready for release. 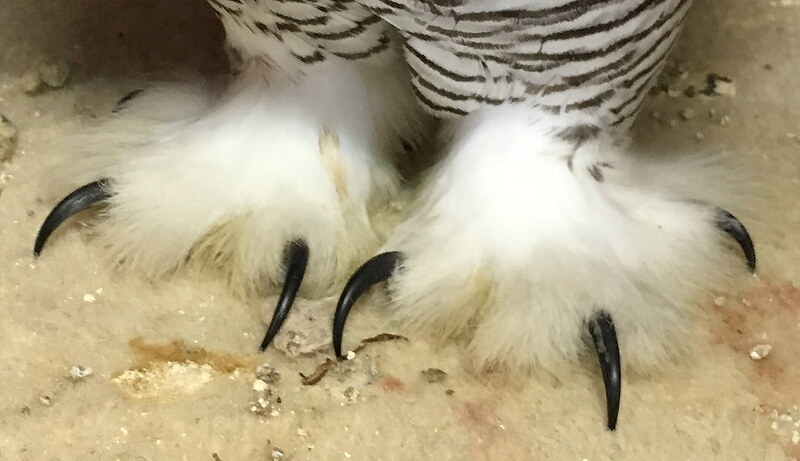 They had to pin the leg fracture and the wing was wrapped and healed very nicely. We bused the kids out to the area that we could release it and they got to help set her free, you can hear them doing the count down. 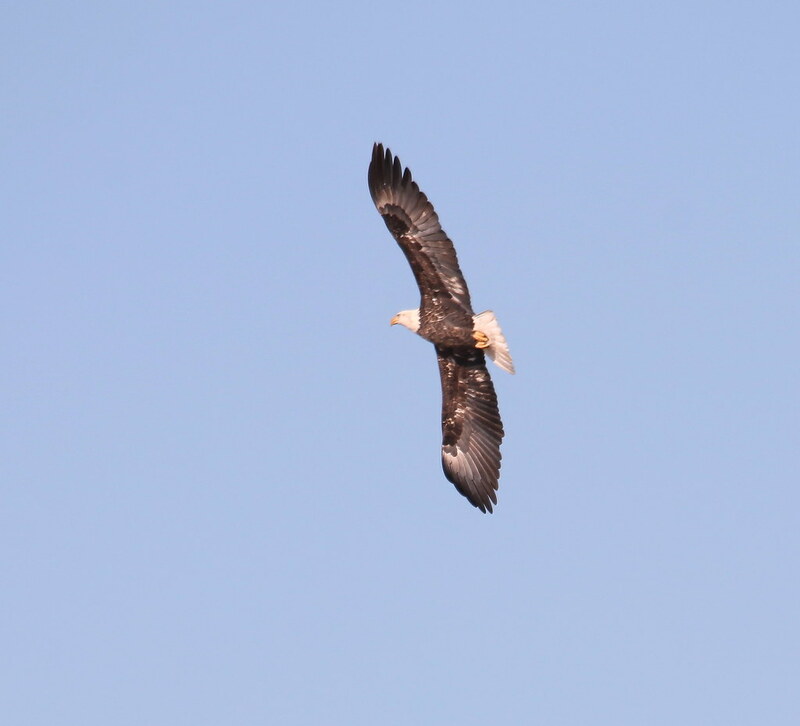 What a neat afternoon to see this bird get back its freedom. What a wonderful way to introduce the rehabbers if the future to the importance of caring for wildlife and habitat. Thank you for organizing that Deb. 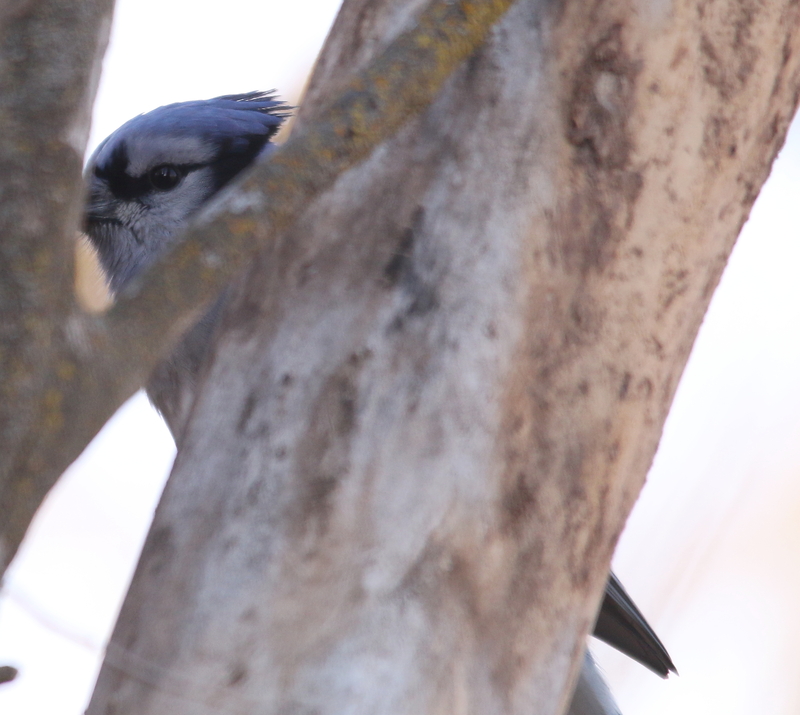 Just a little bird ID challenge time....... who is this fella peeking at me? Took a hike out to the Sherman Ranch. It is pretty much a natural prairie, at first I thought I was only going to see the normal sparrows but as I continued on closer to the bluff areas I spotted some birds up in the trees. 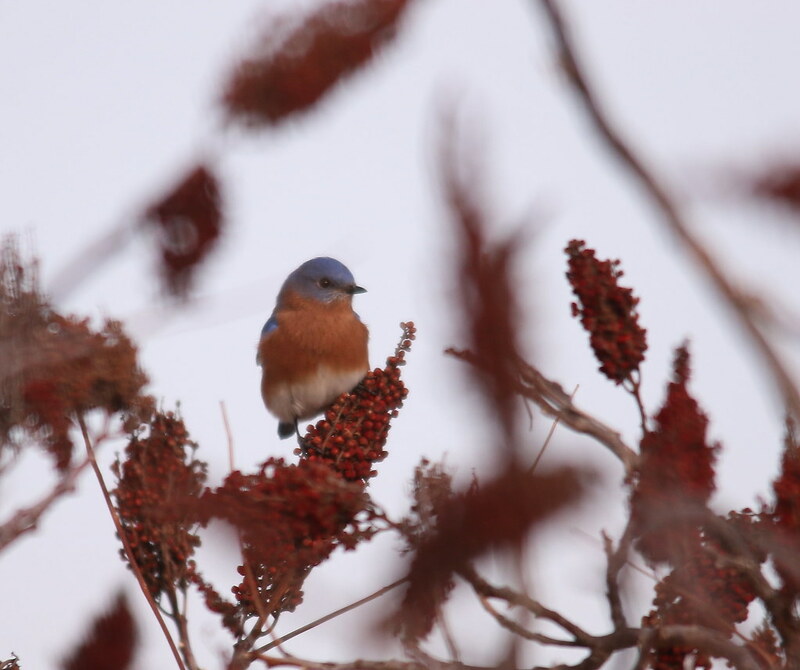 I got to an area that I could watch and they were eastern bluebirds. 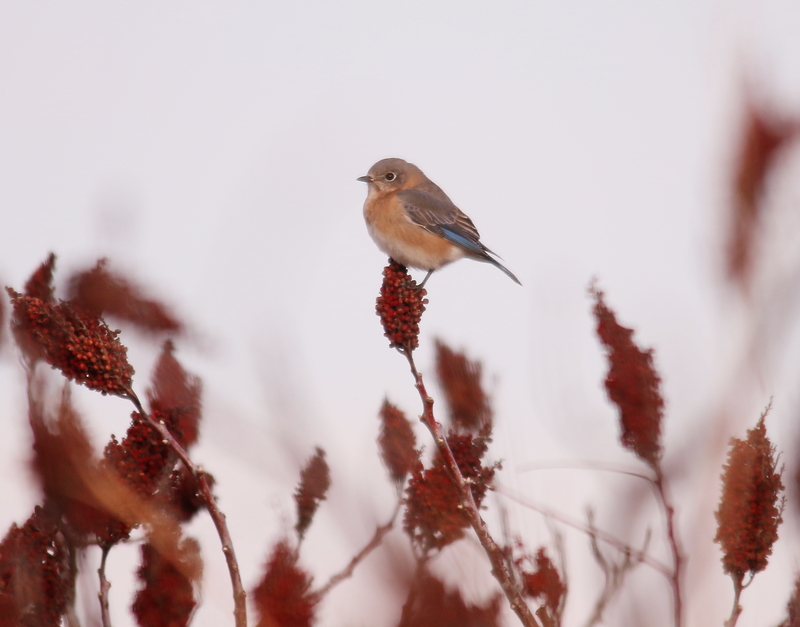 They flew down to some plants that had lots of seeds for them to eat. 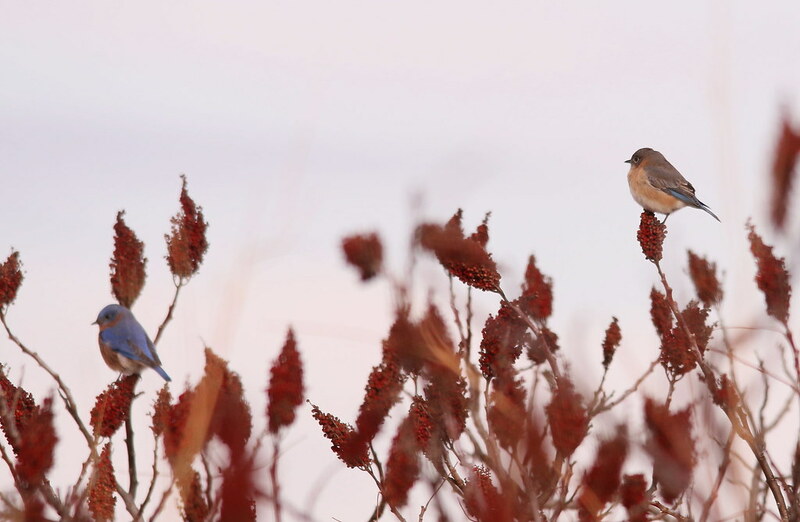 I think they were eating seeds off of a sumac plant.